About a 1,5 hour drive from Dubai, you will find Hatta, an inland enclave of the emirate of Dubai and located in the Hajar Mountains. Traditionally Hatta is the summer get-away of Dubai-based families escaping the heat and humidity. Hatta is your perfect one day trip or weekend getaway. From Dubai you take the E44 which will lead you directly to Hatta. The road from Dubai towards Hatta is a scenic one, as you will see the scenery of skyscrapers of Dubai change into beige colored dunes, into red colored dunes and into a gravel landscape with mountains. You will drive through some small villages where you will find tiny shops with their goods stalled outside. If you decide to take a look and want to buy something, make sure you bargain a good deal as the shops vendors will try to sell at a ridiculous price. On the Dubai to Hatta road you will pass two checkpoints, so make sure to bring your Emirates ID or passport along with you. Otherwise you can make a U-turn back to Dubai. Once you have entered Hatta and encounter the roundabout with a fort, take a right. Continue driving until the end of the road, and then turn left (roundabout). You will see a mosque on the right hand side and keep right after it. You will pass by some houses and a school. At the end of the road (T-junction) go to the left and then you will drive towards the Hatta Dam. You can take some nice picturesque photos here. Drive back to the mosque and then take a right. After a minute or so you will see Heritage Village. Although there is not that much to see, you can stop for half an hour and take some nice photos here in the traditional houses. Entry is free. From Heritage Village follow the road, at the end take a right and you will drive towards the roundabout with the fort again. On the opposite side of the roundabout lies Hatta Fort Hotel. 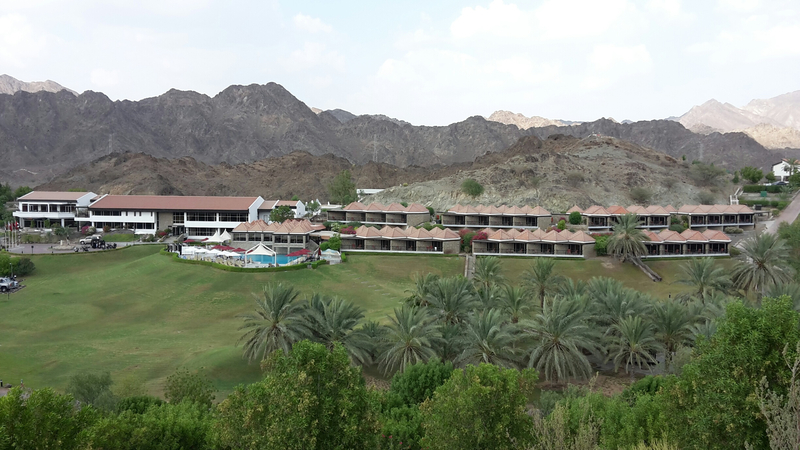 A very nice hotel, with chalet style rooms and a scenic view on the Hajar mountains. You can choose to stay here for the night or only have lunch (good food!). As a day guest, while entering the gate, you need to pay AED 50 (equivalent to USD 13,61) per person for food and drinks. After you have finished your lunch, you will only need to pay extra what you have consumed on top of the AED 50 per person. There are not many activities in Hatta. You can also choose to visit the two military towers from the 18th century and view the Juma mosque (built in 1780) from outside. If you are into off-road adventures in the mountains, Hatta Fort Hotel offers guided four wheel drive mountain and wadi excursions. In case you rent a car, make sure the car covers Oman insurance in case you want to cross the border. Oman is nearby. The Hatta Rock Pools have so far been closed for military reasons.